Being a Will Writer is a great profession. Every day is different. You meet all sorts of people from all walks of life and you get to help them put plans in place that will provide comfort and reassurance to their family during the toughest time of their life. It’s extremely rewarding. 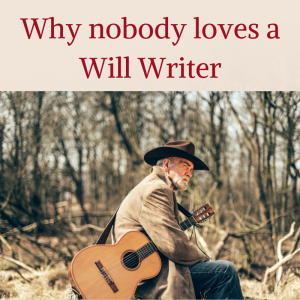 So why does nobody love a Will Writer? Essential as it may be, no-one enjoys the prospect of planning for their own death. More than 50% of people have made no Will at all, which shows the extent to which we are in denial. Some even seem to feel that if they consult a Will Writer, they are ‘pointing the bone’ at themselves – hastening their demise by entertaining thoughts of death! It’s such a shame when the reality of writing a will is that you can finally get relief from gnawing insecurity. Knowing that you have provided for your children, protected your loved ones, paid for your funeral, and avoided unnecessary disputes after you’ve gone will leave you free to enjoy the rest of your (hopefully long) life! There has been a lot of scare-mongering in the tabloids about ‘Cowboy Will Writers’ – wholly unqualified, unaccredited scam artists who set themselves up and tempt the unwary with offers of ‘Wills for £19.99’, then sucker them into higher and higher add-on fees. While it’s true that there are unscrupulous operators out there, there is one key step you can take to protect yourself from second-rate Will Writers: check their accreditation. Just Wills and Legal Services is accredited by both The Society of Will Writers and The Professional Association of Legal Services (PALS). • and that all members are bound to a strict code of conduct. Membership of PALS assures our clients that, in the unlikely event of our company ceasing to exist, all our services would be fulfilled by other members of PALS. So if you’re still pondering your New Year’s Resolutions, perhaps the big one should be to make your will, plan your estate – and don’t fear The Reaper. If you’d like to book a free consultation with one of our legal experts, book online or call 01342 477 102 and quote ‘Will Writer Blog’.